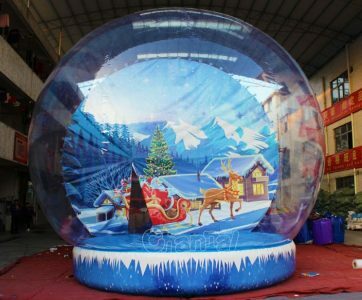 Inflatable snow globe is a human sized bubble globe with a blow up flooring, containing a Christmas themed artwork picture as background for photograph and decoration with snow blowing inside. It’s fun and also memorable for a group of people, such as family members and closed friends, to take a group picture in the giant snow globe. 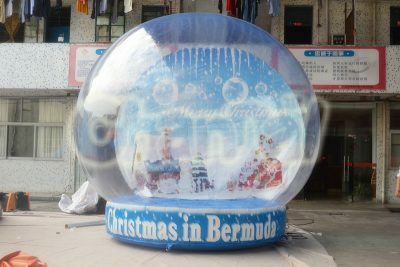 During Christmas holiday season, a snow globe photo booth is a guaranteed and must have moneymaker for rental companies and individuals. 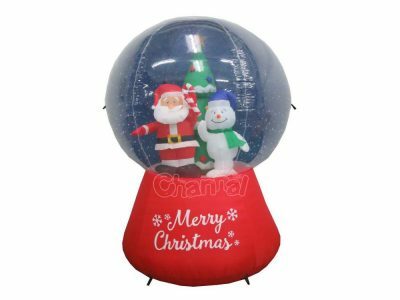 Channal Inflatables is a professional inflatable snow globes manufacturer in China. We can make high quality life size inflatable snowglobes at cheap prices.